Yep, we are talking juicy suits and cool new updates today. Ever thought you would see the day? Or maybe you have been waiting with baited breath to take out that set you have been hoarding for the last ten years? Now is the time, lady. So this was bound to happen. The return of the juicy (esque)suit. First of all, we are all spending way more on athleisure than real clothes these days. Wearing joggers to dinner is a real thing (and when styled right, cute) and there is nothing as comfy as that velour masterpiece that dominated the 90s. Juicy has updated their classic suit a bit and there are plenty of other matched sets that might have a more 00s vibe for those that cannot go down that road. 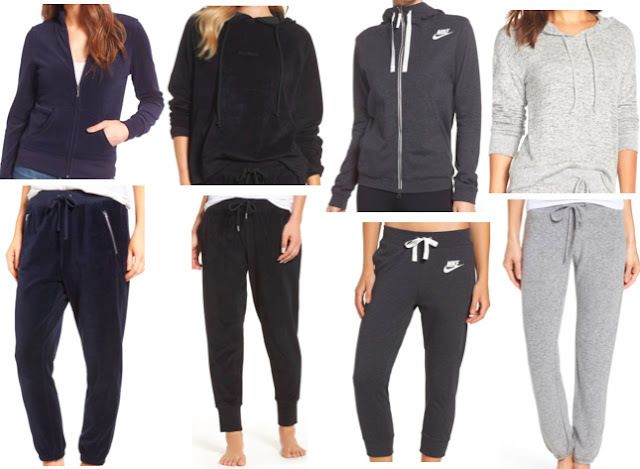 All I know is that the matching sweatsuit is exactly what I want to wear at home and on the go (within reason of course people) all winter long. From Left: Even preppy J. Crew can get in on this action. Top and bottom / Gap has a great velvet version that is on sale. 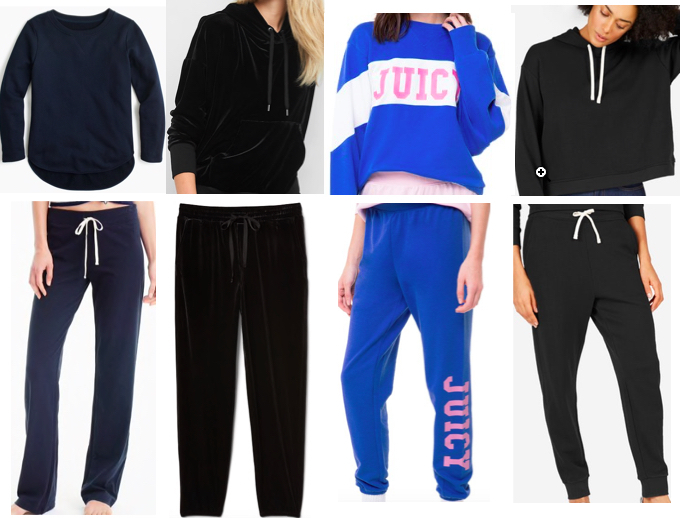 top and bottom / Feel 18 again in this varsity style sweatshirt and classic pants from Juicy / And cool girl Everyone has a French terry version with a great boxy sweatshirt and the perfect jogger. And ps: Amazon has versions for the littles. You bet I ordered one of those! Jenny from the Block! HA! Love these updated choices, the J Crew one is too cute. I recently got a black one piece jogger type piece from CABI and I have been living in it! So cute and somehow feels a bit more.....chic?